This is the second chapter of the ketosis series. The aim of this series, to find a "best method" for achieving physiological ketosis that is easy to follow, effective at achieving physiological ketosis, and enhancing to the body and brain, is generally about health. Health is often vaguely described as a state of well-being or the absence of disease, yet this is unsatisfying since describing something by the absence of something else merely relays what it is not rather than what it is. Consider the sun. The sun is not just the absence of darkness. The sun is also a gigantic sphere of hot plasma that lies at the center of the solar system and emits energy that sustains the majority of life on our planet. In like fashion, health is not just the absence of disease. Health is also something else. That something else must be clarified. Life is inherently dynamic and ever-changing, with the survival of every organism dependent upon a balance between catabolism (breaking down the organism) and anabolism (building up the organism). To illustrate this balance, consider the blood clotting system. Most of the time the clotting system is perpetually breaking down incidental clots so as to ensure proper blood flow, yet if the vessels are damaged it instead builds up clots at the site of damage so as to prevent blood loss. Neither excess catabolism (breaking down clots) nor excess anabolism (building up clots) can be allowed to predominate or else disease will arise - too much catabolism leads to excessive bleeding, too much anabolism leads to excessive clotting. It is the ability to maintain the balance between catabolism and anabolism at the appropriate site and time that defines the survival potential of the clotting system and ultimately the entire organism. Thus, it is better to define health as a biological balance between catabolism and anabolism, the hallmark of this balance being the ability to cycle between these two states at the appropriate site and time. This concept of cycling between catabolism and anabolism underpins the fast and feast cycles of the traditional hunter-gatherer diet. During times of fasting, catabolism predominates and body fat is broken down resulting in a high level of physiological ketosis. During times of feasting, anabolism predominates and body fat is stored resulting in a low level of physiological ketosis. The traditional hunter-gatherer diet is healthy in that it maintains the balance between catabolism and ababolism by perpetually cycling between them. It does not favour either state at the expense of the other, for too much catabolism would lead to eventual wasting whereas too much anabolism would lead to eventual obesity. Therefore our goal is not just to find a method for sustaining a high level of physiological ketosis for that would lead to excess catabolism and eventual wasting, which is not healthy. Rather, it is to find a method for achieving a high level of physiological ketosis, one that gets the body to a high degree of catabolism (indicated by a high level of physiological ketosis) as rapidly as possible followed by a "switch" to a high degree of anabolism (indicated by a low level of physiological ketosis) thus allowing the body to continuously cycle in physiological ketosis. Please remember, these are self-experiments with a sample size of one person - me. It is therefore wise to be cautious in accepting the interpretations of any of my conclusions. In designing a method for cycling in physiological ketosis, weekly cycles are the most appropriate choice as they ought to fit in well with the the typical working weekdays and social weekend, thus being less disruptive on a mental, physical, and social level. Weekly cycles will be catabolic over the five weekdays and anabolic over the weekend. The catabolic weekdays will emphasize fat burning and achieving a high level of physiological ketosis whereas the weekend will emphasize muscle building and resetting to a low level of physiological ketosis. The major foreseeable problem with weekly cycles is that it may prove to be difficult to achieve a high level of physiological ketosis given only five weekdays. To circumvent this issue the method will employ an integrated approach that combines caloric restriction, exercise, fasting, and high fat rather than relying on only one of them. Weekdays need to be catabolic, with an emphasis on fat burning and achieving a high level of physiological ketosis. While not effective at fat burning or achieving a high level of physiological ketosis by themselves, caloric restriction and low intensity aerobic exercise confer other benefits and they will be incorporated although the cornerstones will be fasting and high fat. Ketogenic supplements will be added later. (a) Caloric restriction – 50% recommended caloric intake. By itself, caloric restriction alone is not effective at fat burning or achieving a high level of physiological ketosis but there is reason to suggest that it is beneficial in other ways. A 2009 study stratified 50 healthy, overweight elderly patients into either 30% caloric restriction or normal caloric intake over three months and found that the caloric restriction group displayed a 20% improvement in verbal memory scores as well as improved insulin sensitivity and reduced inflammatory markers compared to the control group (1). The 50% restriction of the catabolic weekdays is too low on its own but with the addition of ketogenic supplements later it will rise considerably, resulting in a gentle caloric restriction for the most part. (b) Low intensity aerobic exercise – 60 minutes walking per day. Low intensity aerobic exercise is not effective at fat burning or achieving a high level of physiological ketosis but evidence shows it to be good for the brain in other ways. A 2006 study randomized 59 healthy but sedentary community dwellers to a modest treadmill protocol or a stretching protocol (both one hour three times a week) and by the end of six months there were significant increases in brain volume on magnetic resonance imaging (MRI) in the treadmill group compared but not the stretching group (2). A 2010 study randomized 11 older adults to either 150 minutes of gentle aerobic exercise (mainly walking) per week or regular stretching for four months and documented significant increases in brain connectivity and resting brain blood flow on MRI in the aerobic exercise group compared to the stretching group at the end of the study period (3). Fortunately, 60 minutes of walking every day is practical and achievable for most people. (c) Fasting - 24 hour fasting intervals. The advantages of fasting were outlined in chapter one. While most of the evidence on fasting relates to multiday fasting, there is some evidence to support the beneficial effects of 24 hour fasts. A 2007 randomized controlled trial subjected 21 normal weight, middle-aged adults to either one or three meals a day over six months (but same total caloric intake in both groups) and found a significant 2.1 kg body fat loss in the one meal a day group versus no body fat loss in the three meals a day group; both groups retained their lean body mass (4). Regular 24 hour fasting intervals strike a nice balance – any shorter makes it difficult to achieve a high level of physiological ketosis whereas multiday fasting may be too socially disruptive. (d) Dietary fat – 60% fat by weight (half of that saturated). The advantages of ketogenic diets were outlined in chapter one. Maintaining 80% fat by weight reduces ingredient options so it is hoped that the caloric restriction and fasting will allow for 60% fat by weight (half of that saturated) while still achieving a high level of physiological ketosis over the five weekdays. Protein intake will be 30% by weight. This may sound high, but with the caloric restriction it amounts to less than 1 g/kg per day which is actually on the low side. Protein intake must be tempered since the liver converts over half of dietary protein into glucose (5). Carbohydrate intake will be 10% by weight (unprocessed only). Unlike their processed cousins, unprocessed carbohydrates are not so evil as the non-digestible fiber inhibits carbohydrate absorption which in turn reduces blood glucose and insulin levels (6) – for example, the Kitavans of the South Pacific eat a diet that consists of 70% unprocessed carbohydrates and yet the average Kitavan body-mass index (BMI) is only 20, blood insulin levels are low, and heart disease and stroke are rare or absent (15-7). However, since the goal of the basic weekday method is to achieve a high level of physiological ketosis, carbohydrate intake must necessarily be kept low. Table 1. Basic weekday meal. (e) A note on coffee. Hunger is a potential pitfall in the basic weekday method and one excellent way to combat it is with black coffee. While the evidence is only correlative, dozens of studies show that regular coffee consumption is associated with many beneficial health effects in humans. Regarding type II diabetes, a massive 2009 systematic review and meta-analysis of 18 prospective studies with 457,922 patients showed each additional cup of coffee consumed per day to be associated with a 7% reduction in type II diabetes risk (8) and another 2009 study examining 40,011 patients over ten years showed that daily consumption of three or more cups of coffee a day is associated with a 42% reduction in type II diabetes (9). Regarding stroke, a 2008 study involving 25,556 male Finnish smokers over 13.6 years showed that high coffee intake is associated with a reduced risk of ischemic stroke (10) while the 2009 Nurses’ Health Study assessed 83,076 women over 24 years and found that those with the highest coffee consumption had the lowest risk of stroke (11). Regarding neurodegenerative disease, a 2009 study of 1,409 elderly patients over 11-26 years demonstrated that people consuming three to five cups a day had a 65% relative risk reduction in developing Alzheimer's disease compared to people drinking little or no coffee (12) while two separate systematic reviews have shown that not only do coffee drinkers have a 20-30% lower risk of developing Parkinson’s disease compared to non-coffee drinkers, but this risk reduction is not explained by bias or confounding variables (13,14); decaffeinated coffee shows no such protective effect in Parkinson’s disease (15). Finally, regarding all-cause mortality, an enormous 2012 study involving 402,260 patients over 13 years revealed that drinking six or more cups of coffee a day is associated with a 10-15% drop in all-cause mortality after adjusting for confounding variables (16). Bottom line, at least three cups of black coffee will be consumed on each weekday. ​Table 2. Method for the catabolic weekdays. Weekends need to be anabolic, with an emphasis on muscle building and resetting to a low level of physiological ketosis. The cornerstones will be caloric excess and high intensity resistance exercise while there will be no significant fasting and dietary fat intake will be moderate. Carbohydrate intake will be increased tremendously. (a) Caloric excess – around 200% recommended caloric intake. Caloric excess is necessary for building skeletal muscle, a tissue that has an underappreciated role in health and disease (17). In fact, it can be argued that the center of metabolic health lies in skeletal muscle, not the heart and lungs as is commonly thought (18). Skeletal muscle has several critical roles. First, it supplies the precursors for the liver to make glucose around the clock in the essential process of gluconeogenesis when glucose intake is low (although ketones can supply up to 75% of the brain’s energy requirements, the brain needs a small steady supply of glucose at all times) (17). Second, skeletal muscle acts as an amino acid reservoir for protein synthesis in vital tissues and organs when protein intake is low or during times of illness or trauma, situations in which the protein synthesis demands of the body may increase by four times or higher; it has been shown that patients with the lowest muscle mass are the least able to survive critical illness or trauma (19,20). Third, skeletal muscle directly contributes to the prevention of many common diseases including obesity, type II diabetes, and osteoporosis (17,18). Last but not least, skeletal muscle weakness is an independent risk factor for mortality in older adults - a 2006 study of 2,292 elderly men and women men over a period of five years showed lower grip and knee extension strength to be associated with increased mortality (21), a 1999 study of 6,040 middle-aged men over a period of 30 years showed lower grip strength to be associated with increased mortality (22), and a 1995 study of 1,142 elderly patients over a period of about four years showed lower grip and knee extension strength to be associated with increased mortality (23) - in these studies it was strength, not muscle mass, that predicted mortality. To improve strength, calories will be increased to around 200% recommended on the weekend; this may seem high but after five days of 24 hour fasting it is not difficult to eat twice as much as normal, quite the contrary - it is enjoyable. (b) High intensity resistance exercise – 20 minutes lifting weights on Saturdays. In addition to caloric excess, there must be a stimulus for building skeletal muscle and the only tried and true method is resistance exercise. In humans, a bout of heavy resistance training elevates the muscle protein synthesis rate to 50% at four hours and to 109% by 24 hours, with a return to baseline by 36 hours (24). In addition to the obvious benefits on strength and its associated mortality reduction there are several compelling reasons for choosing high intensity resistance exercise over endurance exercise. First, and on a theoretical level, high intensity resistance exercise pushes the limits of both anaerobic (glycolysis) and aerobic (Krebs cycle and electron transport chain) metabolism whereas endurance exercise never comes close to pushing the body to its anaerobic limits (18) - in other words, high intensity resistance exercise stimulates all of the components of metabolism while endurance exercise stimulates some of them. Second, high intensity resistance training is superior to endurance exercise even for improving endurance itself; if this statement sounds surreal consider the evidence - a 2005 study assigned 16 men and women to either a sprint group (about eight minutes of stationary all-out sprint cycling per week) or an aerobic group (aerobic jogging, cycling, or aerobics two to three times per week) and found that after just two weeks the endurance capacity in the sprint group increased by almost 100% with no change in the aerobic group (25), a 2006 study that assigned 16 men to either sprint training (six to nine minutes of sprint cycling per week) or endurance training (four to six hours of endurance cycling at 65% of the maximum rate of oxygen consumption per week) over two weeks showed that both groups improved their endurance capacity to the same degree despite the fact that the endurance group spent 97.5% more time engaged in exercise (26), and a recent 2016 study assigned 19 men to either a sprint group (one minute of all-out sprint training three times a week) or an endurance group (45 minutes of continuous training at 70% of the maximum heart rate three times a week) over 12 weeks and found that peak oxygen uptake, glucose tolerance, and skeletal muscle mitochondrial content increased to the same extent in both groups despite a five-fold lower exercise time and volume commitment in the sprint group (27). Third, excessive endurance exercise is not beneficial to health - a gigantic Taiwanese prospective cohort study of 416,175 people over eight years showed that moderate intensity exercise up to 100 minutes per day is associated with a reduced risk of all-cause mortality yet beyond this point there is no additional benefit (28). To top that all off, excessive endurance exercise may be detrimental to health - the 2015 Copenhagen City Heart Study investigated 1,098 healthy joggers and 3,950 healthy non-joggers and found a U-shaped mortality curve, with strenuous joggers having the same mortality rate as a completely sedentary group (29) probably resulting from adverse effects on the heart (30). Needless to say, a single 20 minute high intensity resistance session will be incorporated into every weekend. (c) Fasting - no significant fasting. Obviously, fasting cannot play a central role in muscle building. However, it should be pointed out that fasting is quite good at muscle sparing - as physiological ketosis proceeds there is a drastic reduction in muscle protein breakdown such that lean body mass is spared (31), a fact nicely shown in a 2010 study involving 16 obese patients over ten weeks in which alternate daily fasting reduced overall body weight by 6% while completely sparing lean body mass (32). Nonetheless since muscle building is the goal, the basic weekend method will focus on feasting, not fasting, with two or three big meals a day and even some snacks. (d) Dietary fat - 45% fat by weight (half of that saturated). For muscle building protein and carbohydrate must be elevated. Since the aim of the weekend is to reset to a low level of physiological ketosis rather than entirely eliminate it, fat intake will be 45% by weight (half of that saturated). 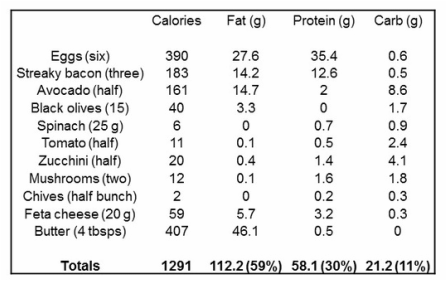 Protein intake will remain at 30% by weight. While this percentage is unchanged from that of the basic weekday method, the weekend caloric excess means that it will be a very high protein intake which is necessary as a daily ratio of 1.5 g of protein per kg of body weight is required to maintain strength (33). Obviously, more than this is required to build strength and so the weekend protein intake per day will be over 3 g of protein per kg of body weight - over four times that of a weekday. Carbohydrate intake will be 25% by weight (processed and unprocessed). Dietary carbohydrate is necessary to replace lost muscle glycogen stores – a classic 1983 paper involving five cyclists over four weeks showed that although exercise performance was not compromised by four weeks of very low carbohydrate intake and physiological ketosis, muscle glycogen stores plummeted by almost half (34). Given the caloric excess, the weekend carbohydrate intake per day will translate to about ten times that of a weekday (the weekend ingredient list will not be shown as the exact ingredients will vary to an extent from one weekend to another). (e) A note on red wine. Weekends are best when riddled with enjoyable social events and one way to partake in social events while cycling in physiological ketosis is with red wine. Much evidence attests to the positive effects of red wine on health. A 2000 randomized controlled trial with 20 overweight women showed that drinking a glass of red wine (190 ml) five days a week for ten weeks had no effects on body weight, BMI, blood glucose, insulin sensitivity, blood pressure, or cholesterol (35). In a 2005 study involving 17 type II diabetic patients randomized to either two glasses of red wine per day (360 ml) or no wine at all, the wine group demonstrated a significant and rather impressive improvement in insulin sensitivity compared to the control group (36). Regarding correlative studies, it is well known that moderate daily red wine consumption is associated with reduced all-cause mortality, particularly cardiovascular mortality (37). Red wine will be consumed every evening during the weekend. Table 3. Method for the anabolic weekend. Physiological ketosis was previously defined as a "sweet spot" in which the blood concentration of the primary circulating ketone, beta-hydroxybutyrate (BHB), lies in the range of 0.3-8 mmol/L. The goal is to cycle within this sweet spot, from a low blood BHB concentration at the start of the weekdays to a high blood BHB concentration by the end of the weekdays, followed by a reset over the weekend. In the following weeks the blood BHB concentration will be measured from Sunday evening to Saturday evening, twice a day. On Saturday evening, the resistance session will be done at a high level of physiological ketosis after which the reset will occur, dropping the blood BHB concentration to around 0.3 mmol/L. On Sunday, the blood BHB concentration will be kept low and then allowed to rise to about 1 mmol/L in the evening so as to provide a consistent starting point for the following week. In assaying the blood BHB concentration a morning and an evening measurement will be taken. The morning measurement will be taken immediately upon waking at 6:30 am and the evening measurement will be taken immediately before dinner at 6:30 pm. The reason for measuring the blood BHB concentration twice a day is that it is lowest in the morning and highest in the evening (38); it is best to capture the entire range of values. 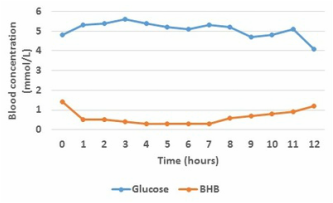 Figure 1 below shows the blood glucose and BHB concentration from morning to evening on a fasting weekday. The blood BHB concentration fell in the morning and rose in the afternoon. One black coffee was consumed at 6:30 am (hour 0) and 12:30 pm (hour 6). Black coffee nudged the blood glucose concentration up a bit but had a negligible effect on the blood BHB concentration. Since the weekday method was set at one meal a day it was critical to know what time of day that meal should be eaten. Therefore the first two weeks of experiments consisted of a comparison of breakfast versus dinner (lunch could not be tested due to work commitments). For each week, 100 ml pure cream was added to the basic weekday meal to ease up on the caloric restriction. 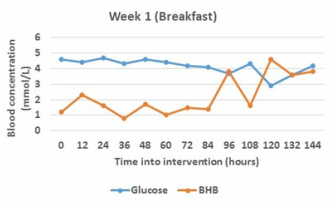 Figures 2 and 3 below show the blood glucose and BHB concentrations for each week (basic weekday meal plus 100 ml pure cream amounting to 65% recommended intake, 65% fat, 25% protein, and 10% carbohydrate per weekday). The x-axis shows the time of the week from Sunday evening (hour 0) to Saturday evening (hour 144) and the y-axis shows the blood concentration of glucose (blue line) and BHB (red line) in mmol/L. During the week, glucose fell from about 5 to 4 mmol/L whereas BHB rose from about 1 to 4 mmol/L. Breakfast produced a mean glucose concentration of 4.15 mmol/L and a mean BHB concentration of 2.22 mmol/L (peaking at 4.6 mmol/L) over the week. Dinner produced a mean glucose concentration of 4.05 mmol/L and a mean BHB concentration of 2.25 mmol/L (peaking at 4.2 mmol/L) over the week. 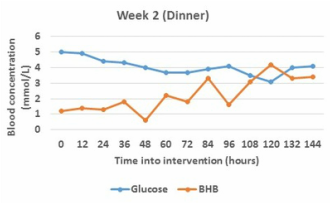 In these experiments, dinner produced a slightly lower mean blood glucose concentration and a slightly higher mean blood BHB concentration compared to breakfast. However, there really was no substantial difference between the two - both achieved a reasonably high mean and peak level of physiological ketosis by the end of the week. Table 4. The level of physiological ketosis achieved for each week. Producing a simple method for cycling in physiological ketosis that achieves a reasonably high blood BHB concentration on a weekly basis is still only part of the stated goal; the method must also be enhancing to the body and brain on a mental, physical, and social level. Until such a day arises, making the decision to contradict conventional thinking remains the hardest step – it gets easier after that. Many people are concerned that physiological ketosis will reduce mental performance as a result of psychological stress, cognitive slowing, and hunger. These things may all occur to some extent during the first few attempts at establishing physiological ketosis but they diminish and disappear with time. Regarding psychological stress, life actually becomes less stressful with one meal day as one can wake up and not have to worry about making breakfast or grabbing lunch while still looking forward to a large dinner in the evening; this frees up no small amount of time that can be used to make the rest of the day less stressful and more productive. Regarding cognitive slowing, this is completely false for once a person achieves a high level of physiological ketosis they actually experience cognitive alertness and a sense of well-being (6). Hunger is of great concern when a person is trying to fast for the first time yet it can be substantially alleviated with black coffee - eventually, it too diminishes or vanishes. In these experiments, breakfast produced slightly more negative effects on cognition compared to dinner. During the breakfast week my appetite was lessened in the morning and it was somewhat difficult to finish the meal. To compound this I went to bed on some nights feeling moderately hungry, did not sleep quite as well, and felt slightly tired the next day which certainly affected my cognitive performance. During the dinner week I could finish the meal with ease. I never went to bed hungry, slept well as a result, and experienced only mild hunger in the late afternoon. Table 5. ​Comparing the negative effects of each week. Training the body to cycle in physiological ketosis does not happen all at once. It takes weeks to months to get “keto-adapted” and even then many people maintain concerns over the physical implications of physiological ketosis, particularly with regards to metabolic shutdown and reduced physical performance. Much of the misunderstanding about physiological ketosis relates to the dreaded “metabolic shutdown” in which basal metabolism is severely reduced resulting in lightheadedness, fatigue, and weakness. Caloric restriction certainly drops the basal metabolic rate and this is the reason that caloric restriction by itself fails to produce lasting fat burning or weight loss – when there is a reduction in calorie consumption, the body correspondingly reduces its energy consumption (39). This fact was beautifully shown by the 1950 Minnesota Starvation Experiment, a study involving 36 healthy young men that was actually a study on restriction, not starvation, as it put its subjects on a 30% caloric intake restriction of 1,500 calories per day for six months (40). The 30% caloric intake restriction produced the metabolic shutdown in all of these men, forcing their basal metabolism to plummet by 30% which made them feel cold, tired, and hungry. It is imperative to note that fasting and ketogenic diets are different. When calories are not just restricted but eliminated as in fasting, or when carbohydrates are not just lowered but essentially excluded as in ketogenic diets, the body does not lower its basal metabolic rate - rather, it is maintained or increased. This has been demonstrated with fasting - a 2005 study that fasted 16 subjects with a normal BMI on alternate days over a total period of 22 days showed that there was no change in resting energy expenditure (41) while a 2000 study that fasted 11 lean subjects over four days showed that resting energy actually increased by 12% (42). This has also been demonstrated with ketogenic diets - even after 25 days of a ketogenic diet there is no slowing of metabolism (39). Bottom line, with fasting and ketogenic diets and therefore physiological ketosis there is no metabolic shutdown. The only caveat to this rule is during the early stages when a person is still getting keto-adapted – an interesting personal account of this can be found in the 1880 diary of US Lieutenant Frederick Schwatka who while travelling in the Arctic was “thrown wholly upon a diet of reindeer meat” which initially left him with a degree of fatigue and weakness, but it disappeared after two to three weeks (43,44). Further misunderstanding over physiological ketosis relates to concerns over reduced physical performance and in discussing this a distinction must be made between endurance and strength. While endurance does suffer during the first one to two weeks of physiological ketosis, after this it is enhanced as demonstrated in a 1980 study involving six obese patients who ate a ketogenic diet for six weeks – after the first week, the time to exertion on a treadmill was 80% of baseline, yet after six weeks and despite having to also wear a 10 kg backpack for second treadmill test since they had each lost that much weight in fat, the time to exertion increased to an impressive 155% of baseline (45). The effects of physiological ketosis on strength are more controversial. A recent 2014 study with eight competitive male off-road cyclists compared the effects of four weeks of a mixed diet to four weeks of a ketogenic diet and found that although the ketogenic diet resulted in more fat loss, favourable changes in the cholesterol profile, and an increased rate of maximum oxygen uptake, it also resulted in a slightly lower maximum cycling workload indicating a reduced ability to do high intensity work (46). However, a 2012 study comparing 30 days of a mixed diet to 30 days of a ketogenic diet in eight elite male gymnasts found no difference with regards to parallel bar dips, jump squats, pull-ups and several other measures of strength performance (47). Being already keto-adapted to an extent, I did not experience any lightheadedness, fatigue, or weakness in these experiments (although I was not immune to it during my initial forays into physiological ketosis), even during the resistance session - I have previously compared the physical effects of completing the resistance session at a low versus a high level of physiological ketosis and found that my energy levels are higher during the latter. 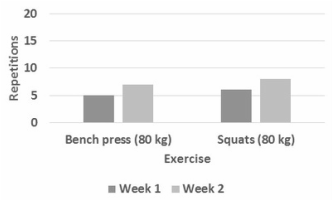 I analyzed the effects of the method on strength over the first two weeks. Figures 4, 5, and 6 below relay the strength analysis for the Saturday evening resistance session. The x-axis shows the particular resistance exercise and the x-axis shows the number of repetitions done. For both weekends, the resistance session was done at a high level of physiological ketosis on Saturday evening. Body weight was measured at the same time on both days using the same scale while all exercises were done in the same order using the same equipment and the exact same weight. 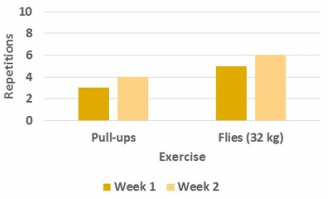 Despite five days of catabolism, body weight did not change and the number of repetitions increased for every exercise. It would seem that although fat was burned, there was no appreciable level of muscle wasting. Table 6. Pre-workout blood glucose and BHB concentrations, body weight, and total repetitions for the resistance session at the end of each week. At face value, cycling in physiological ketosis to the tune of one high fat meal a day on weekdays appears socially isolating. Yet this is not so if that meal is dinner. Most people rarely sit down to enjoy breakfast with family, friends, or work colleagues during weekdays - more likely, everyone is late for school or work and it is probably easier if everyone just skips breakfast altogether. A stronger argument could be made for lunch but not much stronger since lunch is rarely eaten with the family during weekdays, and as for lunch with friends or work colleagues the argument could be made that drinking a cup of coffee instead of eating a meal allows a person to join in conversation without speaking around mouthfuls of food. Let's face it, dinner is the ultimate social meal during weekdays, not breakfast or lunch - dinner allows an entire family, group of friends, or assembly of work colleagues to come together at the end of the day and discuss the events of that day without the time pressures of running off to school or work. While it could be difficult to eat 80% fat by weight at home or at a restaurant, obtaining 60% fat by weight is not as difficult as long as a person focuses on selecting meat, salads, and vegetables, adds generous portions of butter and olive oil to the salads and vegetables, and studiously avoids the bread, pasta, rice, juice, and sugar (if this is not possible due to the meal consisting mainly of processed carbohydrate, it may be time to question the wisdom of regularly consuming such a meal). Finally, for the more sociable weekends when fat intake is reduced and carbohydrate intake is raised, it is possible to cycle in physiological ketosis while enjoying two or three carbohydrate-containing meals a day, including snacks, with family, friends, and work colleagues. Economics is rarely considered in most dietary discussions and yet for some people this is an extremely important factor. Many foods containing large amounts of processed carbohydrates - bread, pasta, rice, juice, and sugar - are cheap. In contrast, many high fat and protein foods such as meat and dairy are relatively expensive. This could be problematic with high fat diets based on three meals a day. Yet with the basic weekday method of one meal a day, costs become dirt cheap. In these experiments, breakfast and dinner each cost exactly the same amount of money. I would argue that weekday costs were trivial and could be covered by anyone living in a western country - in fact, nearly half of the typical weekday cost resulted from buying three cups of coffee each day. Due to the dramatic increase in caloric intake, weekend costs were more substantial but not prohibitively so - nearly half of the total weekend cost resulted from eating the large reset meal at a somewhat high-priced local restaurant. Table 7. ​Comparison of weekday and weekend costs for each week. Hopefully the above rationale and method for cycling in ketosis make sense to you. Take-home points from this chapter are as follows. ​(1) Health is not just the absence of disease, it is a biological balance between catabolism and anabolism with the hallmark of this balance being the ability to cycle between these two states at the appropriate site and time. ​(2) The healthy goal is not to sustain a high level of physiological ketosis at all times, it is to develop a method that cycles in physiological ketosis by achieving a high level of physiological ketosis during weekdays followed by a reset to a low level of physiological ketosis on weekends. ​(3) The catabolic weekdays template (emphasis on fat burning and achieving a high level of physiological ketosis) for the ensuing weeks will be 50% recommended caloric intake, 60 minutes walking per day, 24 hour fasting intervals, and 60% fat by weight (half of that saturated), to which ketogenic supplements will be added. (4) The anabolic weekend template (emphasis on muscle building and resetting to a low level of physiological ketosis) for the ensuing weeks will be around 200% recommended caloric intake, 20 minutes of weightlifting on Saturdays, no significant fasting, and 45% fat by weight (half of that saturated). ​(5) There is no notable difference in the mean level of physiological ketosis achieved by breakfast (mean blood BHB concentration 2.22 mmol/L) versus dinner (mean blood BHB concentration 2.25 mmol/L) over the five weekdays; both peaked at over 4 mmol/L. ​(6) Mentally - less hunger, better sleep, and fewer negative effects on cognition were experienced during the dinner week. (7) Physically - despite five days of catabolism body weight did not change and strength increased by the end of the two weeks. (8) Socially - the weekday method is dirt cheap; the weekend method is more expensive but not prohibitively so. Owing to its superior mental and social profile, dinner will be chosen over breakfast for the "best method" outlined above. While the method appears simple to follow and these preliminary results are encouraging, it remains to be seen how much more effective it can be at achieving physiological ketosis and enhancing to the body and brain - in the ensuing weeks we will try to do exactly that with the addition of various ketogenic supplements. (1) Witte et al. 2009. Caloric restriction improves memory in elderly humans. Proceeding of the National Academy of Sciences of the United States of America 106(4), 1255-1260. (2) Colcombe et al. 2006. Aerobic Exercise Training Increases Brain Volume In Aging Humans. Journal of Gerontology 61A(11), 1166-1170. (3) Burdette et al. 2010. Using Network Science to Evaluate Exercise-Associated Brain Changes in Older Adults. Frontiers in Aging Neuroscience 2(23), 1-10. (4) Stote et al. 2007. A controlled trial of reduced meal frequency without caloric restriction in healthy, normal-weight, middle-aged adults. The American Journal of Clinical Nutrition 85(4), 981-988. (5) Jungas et al. 1992. Quantitative analysis of amino acid oxidation and related gluconeogenesis in humans. Physiological Reviews 72(2), 419-448. ​(6) Fung. 2016. The Obesity Code: unlocking the secrets of weight loss. Scribe. (7) Lindeberg et al. 1999. Low serum insulin in traditional Pacific Islanders – the Kitava Study. Metabolism 48(10), 1216-1219. (8) Huxley et al. 2009. Coffee, Decaffeinated Coffee, and Tea Consumption in Relation to Incident Type 2 Diabetes Mellitus. Archives of Internal Medicine 169(22), 2053-2063. (9) Van Dieren et al. 2009. Coffee and tea consumption and risk of type 2 diabetes. Diabetologia 52(12), 2561-2569. (10) Larsson et al. 2008. Coffee and tea consumption and risk of stroke subtypes in male smokers. Stroke 39(6), 1681-1687. (11) Lopez-Garcia et al. 2009. Coffee consumption and risk of stroke in women. Circulation 119(8), 1116-1123. (12) Eskelinen et al. 2009. Midlife coffee and tea drinking and the risk of late-life dementia: a population-based CAIDE study. Journal of Alzheimer’s Disease 16(1), 85-91. (13) Costa et al. 2010. Caffeine exposure and the risk of Parkinson’s disease: a systematic review and meta-analysis of observational studies. Journal of Alzheimer’s Disease 20, S221-S238. (14) Hernan et al. 2002. A meta-analysis of coffee drinking, cigarette smoking, and the risk of Parkinson’s disease. Annals of Neurology 52(3), 276-284. (15) Palacios et al. 2012. Caffeine and risk of Parkinson’s disease in a large cohort of men and women. Movement Disorders 27(10), 1276-1282. (16) Freedman et al. 2012. Association of Coffee Drinking with Total and Cause-Specific Mortality. NEJM 366, 1891-1904. (17) Wolfe. 2006. The underappreciated role of muscle in health and disease. The American Journal of Clinical Nutrition 84(3), 475-482. (18) Little J and McGuff D. 2009. Body By Science: A Research Based Program for Strength Training, Body Building, and Complete Fitness in 12 Minutes a Week. McGraw-Hill. (19) Kadar et al. 2000. The prognostic value of body protein in patients with lung cancer. Annals of the New York Academy of Sciences 904, 584-591. (20) Pereira et al. 2006. Age-Dependent Differences In Survival After Severe Burns: A Unicentric Review of 1,674 Patients and 179 Autopsies over 15 Years. Journal of the American College of Surgeons 202(3), 536-548. (21) Newman et al. 2006. Strength, But Not Muscle Mass, Is Associated With Mortality In The Heath, Aging, And Body Composition Study Cohort. The Journals of Gerontology Series A 61(1), 72-77. (22) Rantanen et al. 1999. Muscle Strength and Body Mass Index as Long-Term Predictors of Mortality in Initially Healthy Men. The Journals of Gerontology Series A 55(3), M168-M173. (23) Laukkanen et al. 1995. Muscle Strength and Mobility as Predictors of Survival in 75-84 Year Old People. Age and Ageing 24(6), 468-473. (24) MacDougall et al. 1995. The time course for elevated muscle protein synthesis following heavy resistance exercise. Canadian Journal of Applied Physiology 20(4), 480-486. ​(25) Burgomaster et al. 2005. Six sessions of sprint interval training increases muscle oxidative potential and cycle endurance capacity in humans. Journal of Applied Physiology 98, 1985-1990. ​(26) Gibala et al. 2006. Short-term sprint interval versus traditional endurance training: similar initial adaptations in human skeletal muscle and exercise performance. The Journal of Physiology 575(3), 901-911. ​(27) Gillen et al. 2016. 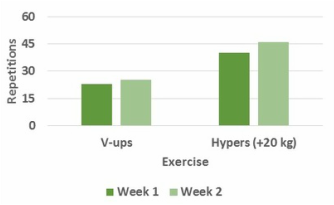 Twelve Weeks of Sprint Interval Training Improves Indices of Cardiometabolic Health Similar to Traditional Endurance Training Despite a Five-Fold Lower Exercise Volume and Time Commitment. PLOS One 11(4), e0154075. ​(28) Wen et al. 2011. Minimum amount of physical activity for reduced mortality and extended life expectancy: a prospective cohort study. Lancet 378(9798), 1244-1253. (29) Schnohr et al. 2015. Dose of jogging and long-term mortality: the Copenhagen City Heart Study. Journal of the American College of Cardiology 65(5), 411-419. (30) Lee et al. 2016. The impact of excessive endurance exercise on the heart. BC Medical Journal 58(4), 203-209. ​(31) McDonald. 1998. The Ketogenic Diet: A Complete Guide for the Dieter and Practicioner. Morris Publishing. ​(32) Bhutani et al. 2010. Improvements in coronary heart disease risk indicators by alternate-day fasting involve adipose tissue modulations. Obesity 18(11), 2152-2159. ​(33) Davis and Phinney. 1990. Differential effects of two very low calorie diets on aerobic and anaerobic performance. International Journal of Obesity 14(9), 779-787. ​(34) Phinney et al. 1983. The human metabolic response to chronic ketosis without caloric restriction: preservation of submaximal exercise capability with reduced carbohydrate oxidation. Metabolism 32(8), 769-776. (35) Cordain et al. 2000. Influence of moderate chronic wine consumption on insulin sensitivity and other correlates of syndrome X in moderately obese women. Metabolism 49(11), 1473-1478. (36) Napoli et al. 2005. Red wine consumption improves insulin resistance but not endothelial function in type 2 diabetic patients. Metabolism 54(3), 306-313. (37) German and Walzem. 2000. The health benefits of wine. Annual Review of Nutrition 20, 561-593. ​(38) Fife. 2011. Stop Alzheimer's Now! Piccadilly Books. (39) Fung. 2016. The Biggest Loser Diet – Explained! https://intensivedietarymanagement.com/biggest-loser-diet-explained/. (40) Keys et al. 1950. The biology of human starvation. University of Minnesota Press. (41) Heilbronn et al. 2005. Alternate-day fasting in nonobese subjects: effects on body weight, body composition, and energy metabolism. The American Journal of Clinical Nutrition 81(1), 69-73. (42) Zauner et al. 2000. Resting energy expenditure in short-term starvation is increased as a result of an increase in serum norepinephrine. The American Journal of Clinical Nutrition 71(6), 1511-1515. (43) Stackpole. 1965. The long arctic search: the narrative of Lieutenant Frederick Schwatka. The Marine Historical Society. (44) Phinney. 2004. Ketogenic diets and physical performance. Nutrition and Metabolism 1:2. (45) Phinney et al. 1980. Capacity for Moderate Exercise in Obese Subjects after Adaptation to a Hypocaloric, Ketogenic Diet. The Journal of Clinical Investigation 66(5), 1152-1161. ​(46) Zajac et al. 2014. The Effects of a Ketogenic Diet on Exercise Metabolism and Physical Performance in Off-Road Cyclists. Nutrients 6(7), 2493-2508. (47) Paoli et al. 2012. Ketogenic diet does not affect strength performance in elite artistic gymnasts. Journal of the International Society of Sports Nutrition 9:34.